The term, “refried beans” is a misnomer. The correct translation of the Spanish, “frijoles refritos,” is “well fried beans.” No fat required. Properly cooked beans and rice are a delicious meal.They’re also complete, nutritious protein. The recipes below rely on basic, straightforward technique. It’s the way families have been cooking them at home for generations. 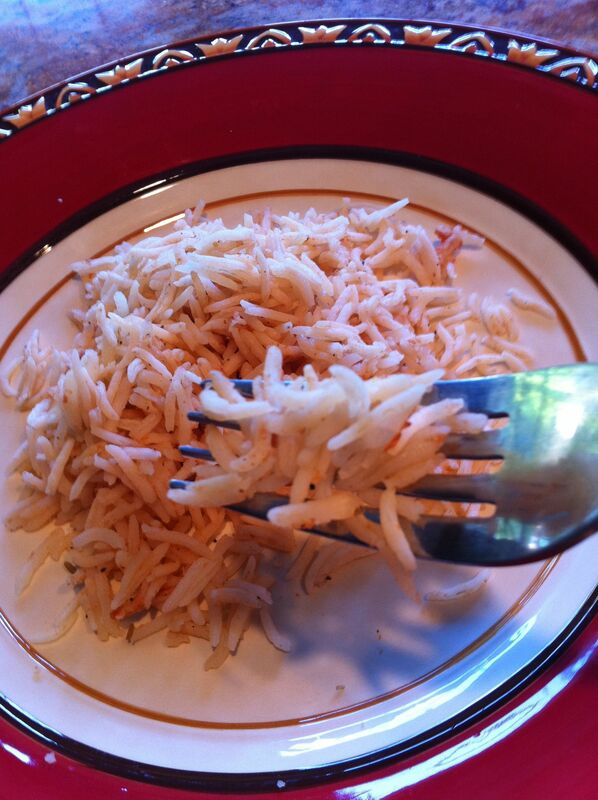 Fluffy “Arroz” has a subtle aroma of cumin and black pepper. 1) Heat develops the flavor. Pay close attention to your fire. 2) No fat. Well, ok you do actually add fat, but very little, to boost the heat. The fat also adds a nice smoothing, mellow mouth feel. But be judicious and don’t hide subtle flavors with fat. 3) Easy on the seasonings. They are there to enhance, not dominate the flavor. The rice is fluffy. It has a full taste with just a bit of color from tomatoes, a slight undercurrent of cumin and, most importantly, no heavy fat taste to hide the flavor. The beans cooked as in the recipe below will have a rich, robust umami taste. (this and other recipes are adapted from the book, “Truly Texas Mexican: A Native Culinary Heritage In Recipes” published by Texas Tech University Press. 1. In a molcajete make a paste of the cumin, black peppercorns, salt and garlic. 2. In a deep skillet (add the oil if you like to) cook the rice over medium heat until it begins to take on some color. 3. Add some of the water to the molcajete to remove all the ingredients and pour into the rice, being careful with the splatter. Add the crushed tomato and its juice. 4. Bring the water to a boil, cover and lower the heat to very low. 5. Cook, covered, for 15 minutes or so until the rice is fully cooked. Try not to remove the cover more than once as you check for doneness. The rice will be tender, fluffy and gently aromatic of cumin and black pepper. 1. Nothing to cooking the beans, really. Just place all the ingredients except the salt in a crockpot and cook for 6 to 8 hours or so until they are completely tender. I do this at night and go to sleep. If on the stovetop, boil them for 3 hours, maybe 4, depending on the beans. Keep adding water so they don’t dry out or burn. If you want a foolproof method of testing for doneness, hold a couple of the beans in the palm of your hand and blow on them. If the skin peels off a bit, they’re done just right. Thanks to my mother and sisters who kept showing me this. Add the salt and adjust accordingly. 2. 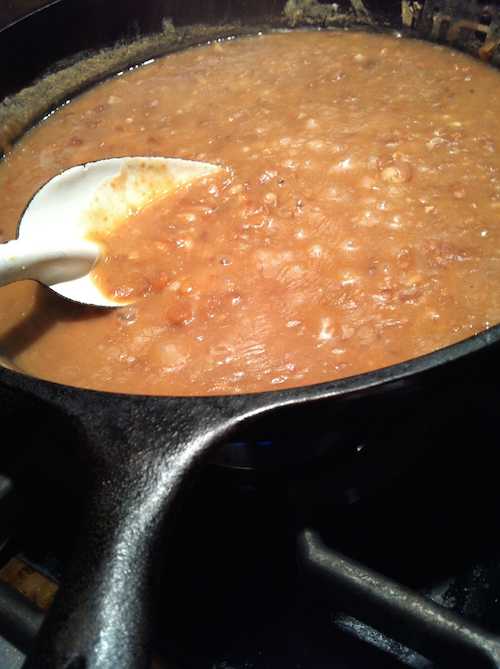 To make “frijoles refritos,” “refried beans,” place the amount of beans you want to cook in a skillet with an equal amount of water and bring to the boiling point. Turn the heat down and cook on a medium simmer. I cringe at translating the name as “refried beans” because it induces non-spanish speakers to misunderstand and go for heavy fat frying. Eating overly greasy beans is not in our tradition. In a later post we’ll discuss when and how it was that high fat entered Mexican restaurant food in Texas. 3. 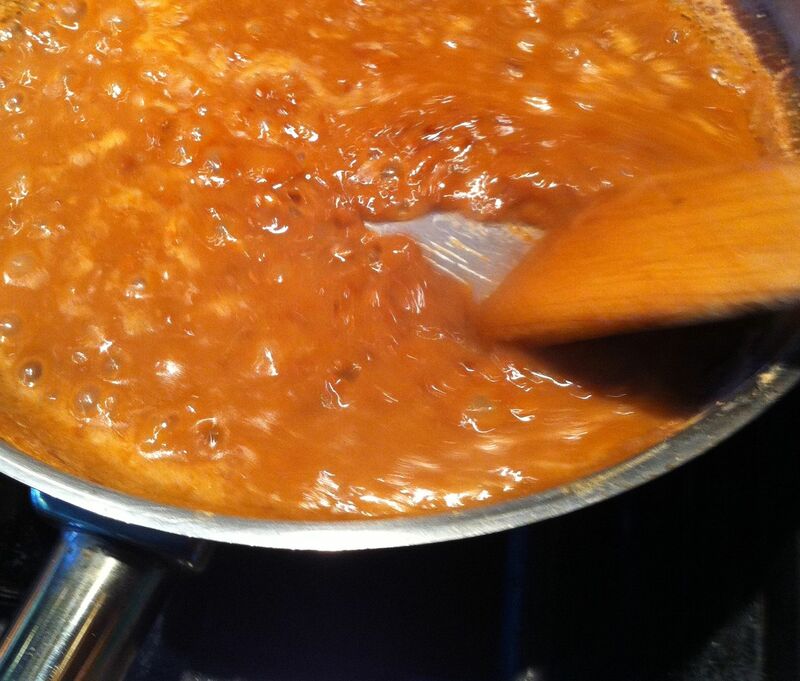 Here’s the flavor: Mash the beans with a masher and as you do so notice that the heat at the bottom of the skillet is browning the bean paste. This is the Maillard reaction, a complex change in the molecular structure of the protein in the beans that happens around 300º Fahrenheit. Keep scraping the bottom of the skillet and brown the beans slowly. Add a little more water if it becomes dry. The color will deepen and the flavor will become rich, hinting of bacon or beef. The secret is: scrape, scrape, scrape. The addition of oil to the skillet helps to increase the heat and the browning but you don’t need it for flavor. I don’t use any at all, but you can add one Tablespoon of Canola oil if you like. Keep browning the beans in this way slowly for about 20 minutes. Don’t burn them. The taste will have depth. Restaurants usually don’t serve beans with such developed and sumptuous flavor because it”s easier (and doesn’t require staff training) to just purée them in a blender and serve. Some fast food places will add some bacon in the cooking for strong flavor. I can understand having to make those decisions, but to me, these obvious fixes seem heavy-handed and the outcome is nothing at all like the real thing. I’ve worked at restaurants where I’ve shared this simple technique of cooking beans and it is not at all difficult for the staff. Vegan Chef Staci Davis’s restaurant, Radical Eats where I worked and introduced this technique, used the technique for their delicious beans. It would be both more healthy and more delicious if more Mexican food restaurants served less fat and more bean flavor. ¡Buen provecho / Bon Appétit! Do you Understand my Enchilada? thank you for the response. now I can look for this bean type. this is exactly what i wanted!!! thankyou!!!! i cannot wait to make them for a little get together. What a nice thing to say, Jenny. Thanks. I have such fond memories of the times we worked together. Very happy that you are making delicious Texas Mexican pinto beans! You are king of beans in my book. I have always used your method since the first day you showed me how easy it was to make these beans!! !